A bulkhead with access holes separated the hull gunner and the driver from the fighting compartment. The tank Cruiser Mk.VIII “Cromwell” is a British medium cruiser tank used during the Second World War. It was named after the leader of the English Civil War Oliver Cromwell. 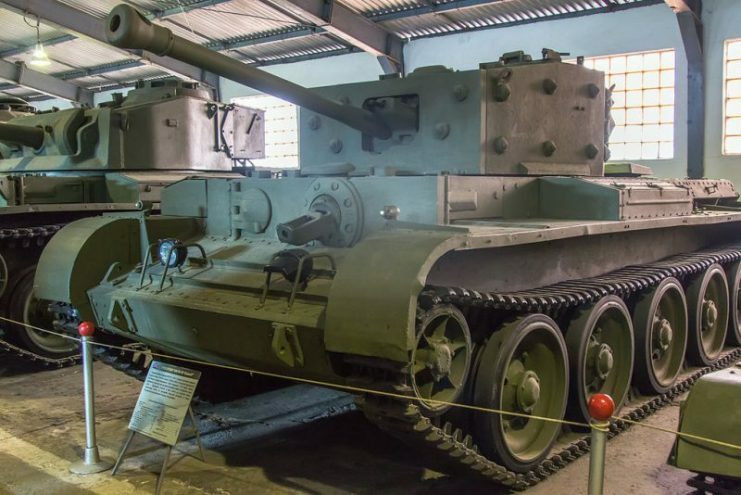 In Britain’s military lists, the Cromwell tank was designated A27M. By the end of 1942, the British leadership was aware of the threat from the new German tanks that had appeared on the fronts. To combat them, it was necessary to create a cruising tank which could go up against the German Panthers and Tigers to a decent degree. 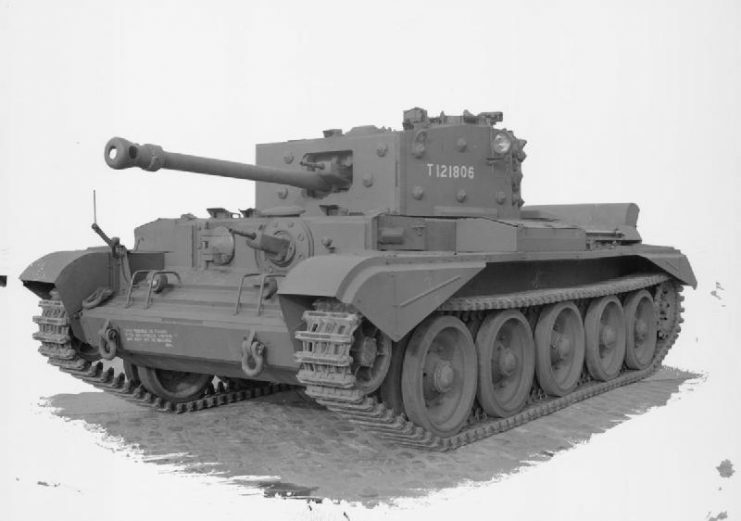 However, talks about the development of Cromwell and Centaur date back to 1940, codenamed A23 and A24. The British military were conscious that the Crusader tank would become obsolete and so were seeking a future replacement. Vauxhall Motors Limited submitted the A23 for consideration, which was a scaled down version of the A22 Churchill tank. Nuffield Mechanizations and Aero Limited offered up the A24 which was heavily based on a Crusader design and had a Liberty V-12 engine. It was hoped that, since it was based on a previous design, it could be put into production quickly. Leyland Motors Limited, in conjunction with The Birmingham Railway Carriage and Wagon Company (BRC&W) presented a tank that was considered similar to Nuffield’s A24. In early 1942, the Mk. VIII Centaur had been created, but this tank design was abandoned as not fit for purpose due to the unreliability of the engine. It was suggested that a new Rolls-Royce engine be fitted, but Nuffield was not prepared to redesign the A24 for the new engine. Consequently, in October 1942, taking the Centaur layout scheme as a basis, Leyland presented a new cruiser tank to the military department, called the Cruiser Mk. VIII Cromwell. In early 1943, the new tank with its Rolls-Royce Meteor engine was put into production at factories in the cities of Birmingham and Coventry. During the period of serial production, Cromwell was repeatedly upgraded, and 4016 copies were released. In all, 3066 A27M Cromwell were built, and adding 950 A27L, the entire A27 class was 4016 tanks strong. 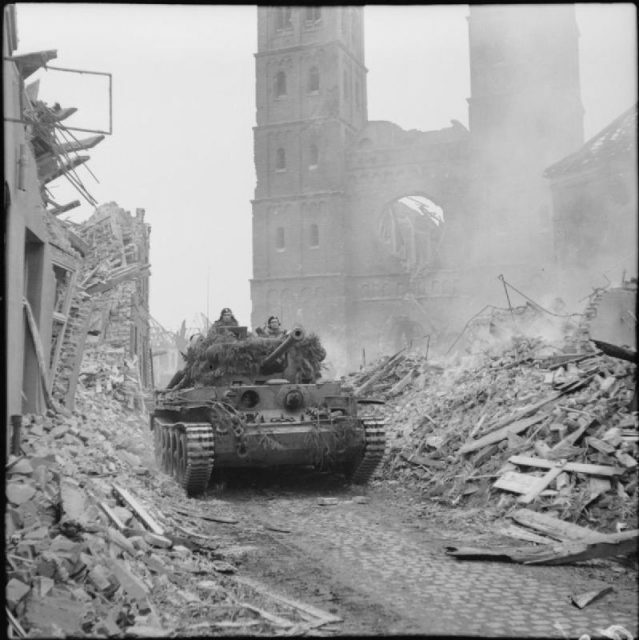 A King’s Royal Hussars Cromwell of the 11th Armoured Division advances through Uedem, Germany, February 28, 1945. Cromwell has a classic layout. The crew consists of five people. Initially, the frame was made of riveted construction, but later welding was used. The boxy turret sat above the central fighting compartment, isolated both from the engine and front compartments. A bulkhead with access holes separated the hull gunner and the driver from the fighting compartment. A second bulkhead separated the fighting compartment from the transmission and engine compartment. 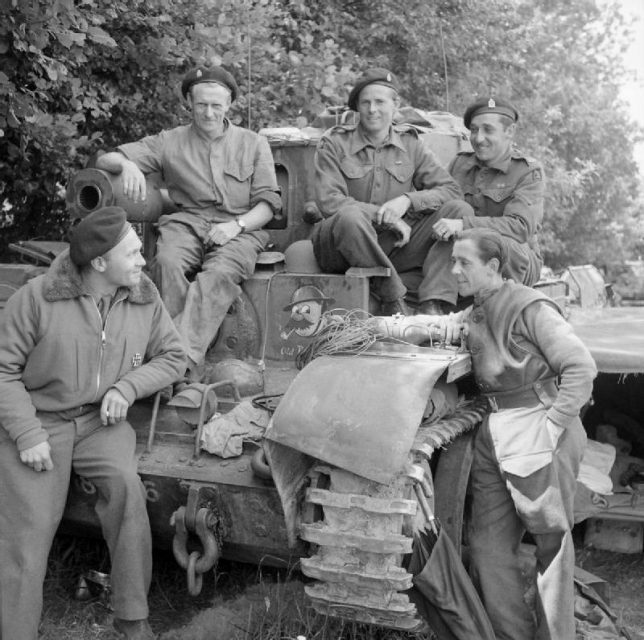 Cromwell VI tank and crew of 4th County of London Yeomanry, 7th Armoured Division, June 17, 1944. Cromwell was heavier than the Сrusader. This was thanks to the reinforced armor which, depending on the version, reached a thickness of 3 to 4 inches (76-100 mm). However, Cromwell compensated for the increased weight with a powerful Rolls-Royce Meteor engine. 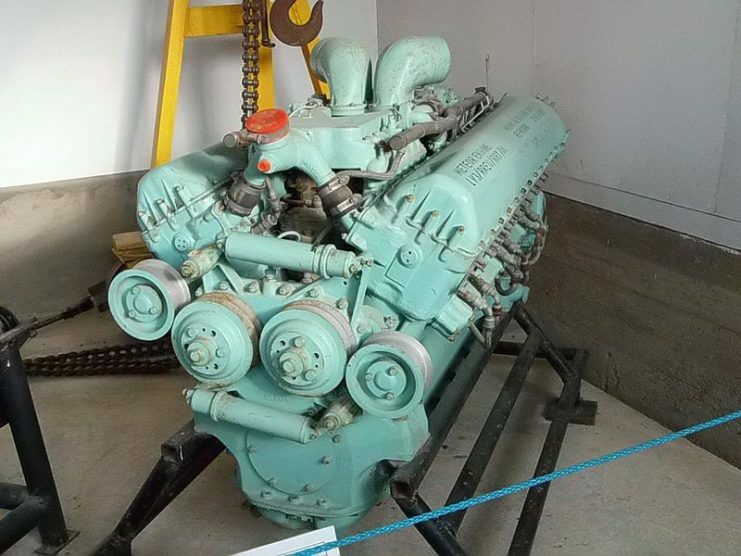 This was a version of the famous Rolls-Royce Merlin aircraft engine which was installed in Lancaster, Spitfire, and many other aircraft of the Second World War period. The V-shaped 12-cylinder Meteor was one of the most reliable engines mounted on a British tank. Thanks to this engine, Cromwell can be called one of the high-speed British tanks during World War II. Engine power was up to 600 horsepower, which made it possible for tank to the maximum speed of 40 mph (64 km/h). By the time the Mk. III was being produced, the main armament consisted of a QF 6 pounder gun (57 mm). Cromwell Mk. IV and Cromwell Mk. V were armed with a 75mm QF 75 gun. 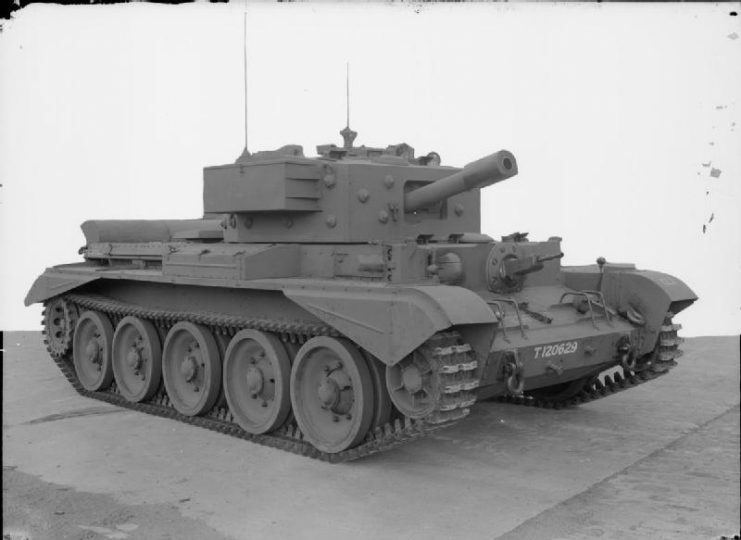 Modifications of Cromwell Mk. VI and Cromwell Mk. VIII were armed with a 95-mm howitzer and belonged to the class of assault tanks. A Cromwell Mk IV of No. 2 Squadron, 2nd (Armoured Reconnaissance) Battalion, Welsh Guards, at Pickering in Yorkshire, March 31, 1944, displays its speed during an inspection by Winston Churchill. The first tests were conducted in August-September 1943 in the UK. Cromwell proved to be more reliable in contrast to the older brother of the Centaur, but both tanks lagged behind the American Sherman. Test Leader Major Clifford noted that he would not want to manage the A27L Centaur tank unit due to its unreliability and numerous service personnel. 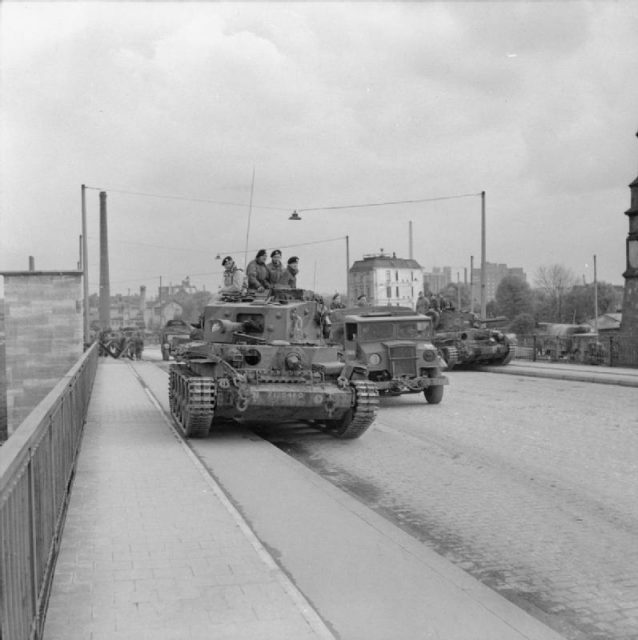 Cromwell tanks of 7th Armoured Division in Hamburg, May 3, 1945. 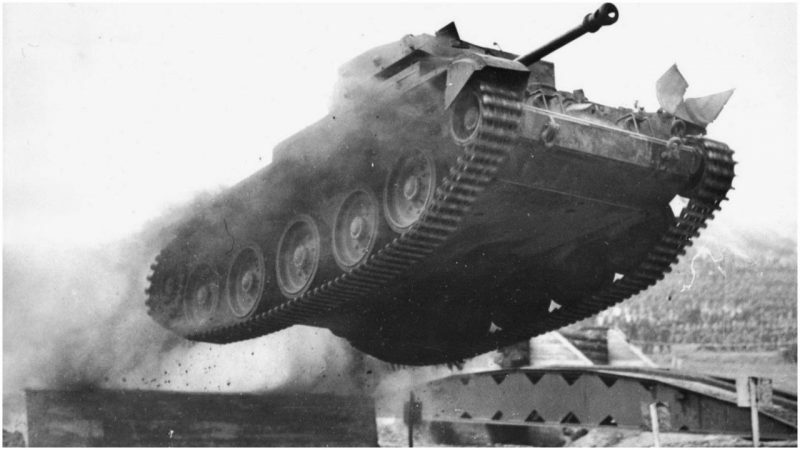 According to him, the Cromwell could have become a valuable fighting vehicle, but in its present form at the time, it could only be considered as a prototype requiring further refinement. Cromwell VIIw with type Dw or Ew hull, showing welded construction with applique armor. Cromwell participated in the hostilities of the Second World War in Western Europe as well as in North Africa. It saw its first fighting in the Battle of Normandy in June 1944. 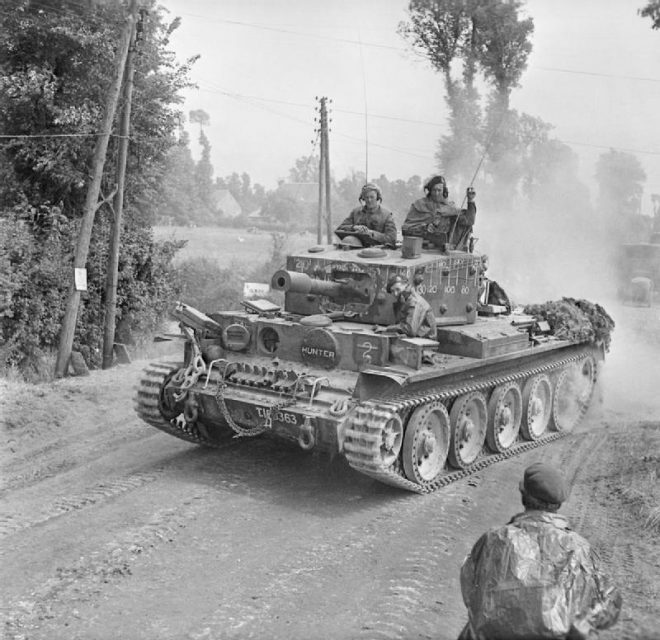 The tank was in service with the reconnaissance regiments of the Royal Armoured Corps, in the 7th Armoured Division, 11th Armoured Division, Guards Armoured Division, 1st (Czechoslovakian) Independent Armoured Brigade Group as part of the First Canadian Army, 6th Airborne Division and others. 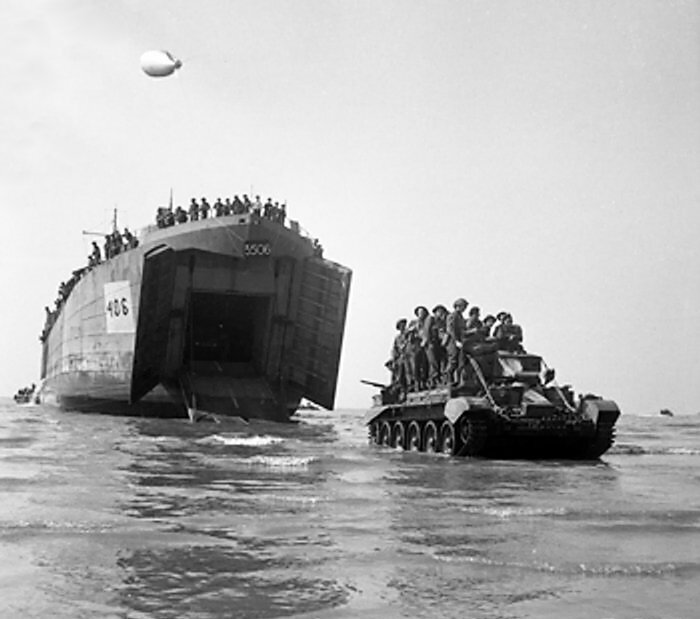 A Cromwell pursuit tank with men aboard making for the Arromanches beaches after leaving an LST (Landing Ship Tank) on June 6, 1944. In Western Europe, it was given reconnaissance missions due to its high speed and low profile, which made it harder to spot. Cromwell VI with type F hull, showing driver’s side-opening hatch and turret storage bins. The most significant drawbacks of the Cromwell were weak firepower and insufficient armor. Under certain conditions, the tank was able to compete with the German Panther, although it couldn’t penetrate its frontal armor. However, the Cromwell was relatively weak in front of the heavy Tiger tanks. 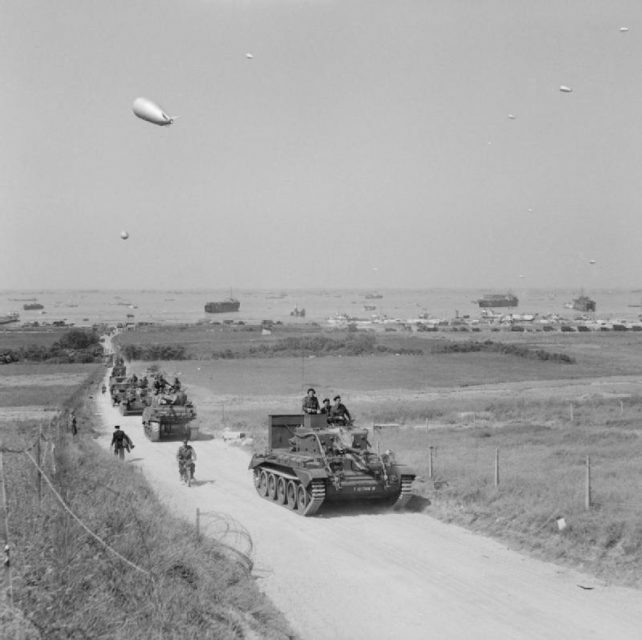 Cromwell tank leads a column of armor from 4th County of London Yeomanry, 7th Armoured Division inland from Gold Beach, June 7, 1944. 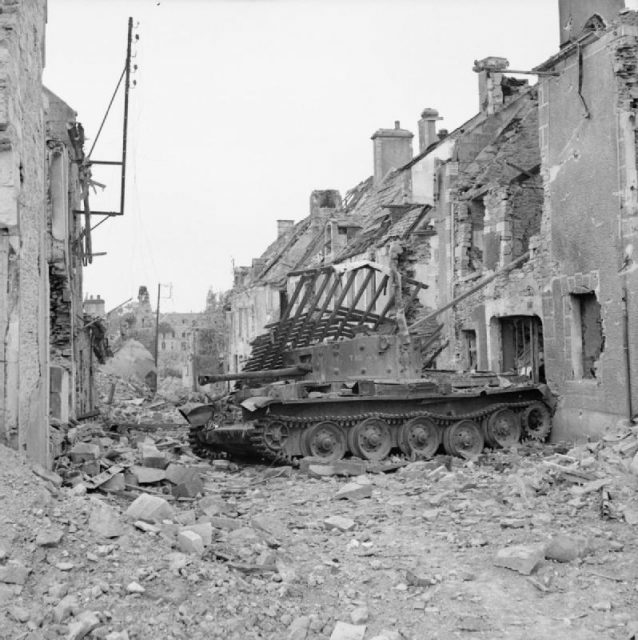 In the battle of the French town of Villers-Bocage on June 13, 1944, German heavy Tiger tanks led by Michael Wittmann defeated the British convoy with minimal losses. The main part of the British forces were Cromwell tanks. Knocked-out Cromwell observation post tank in Villers-Bocage, 5 August 1944. After the war, the Cromwell took part in the Korean War with the 8th King’s Royal Irish Hussars and the 7th Royal Tank Regiment. In the 1955, the tank was retired in favor of newer tanks. After the war, the Cromwell was provided to various countries around the world such as Israel, Austria, Jordan, Finland, and the socialist countries of Poland and Czechoslovakia. 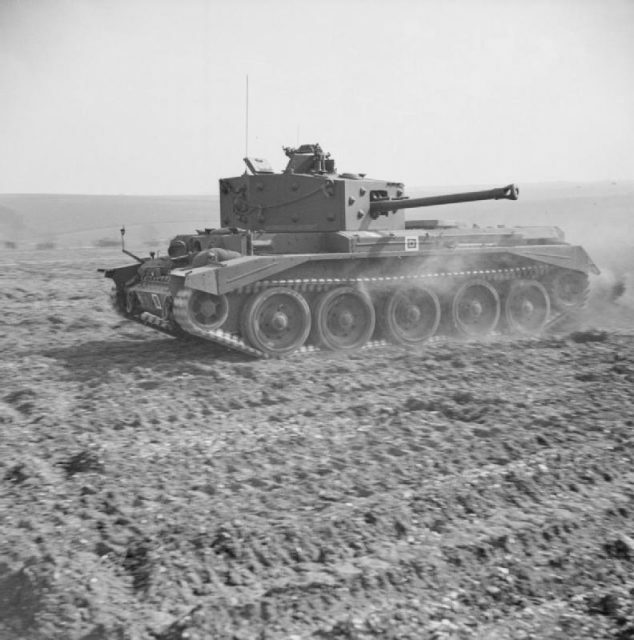 As part of the Jordanian and Israeli armies, the Cromwell took part in the Six-Day War but was inferior in all respects to newer tanks at that time. Under the Lend-Lease program, six Cromwell tanks were delivered to the Soviet Union. However, there is no information about their combat use on the Eastern Front.